Our good friends Joe and Melissa got married in July of 2001 and we decided to crash their honeymoon. 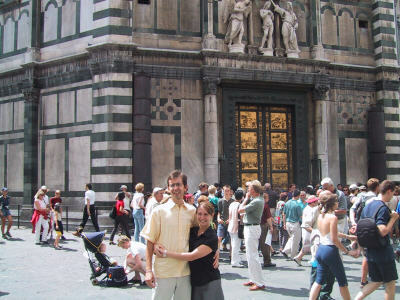 Their itinerary included Venice, Florence, and southern Italy, but we only interupted their wedded blish for a few days while in Florence (Firenze). One of the truly great things about living in Britain is the availability of cheap flights. You'll notice from this web site that we've been to some pretty cool places and lots of them. The experiences really haven't been that expensive. 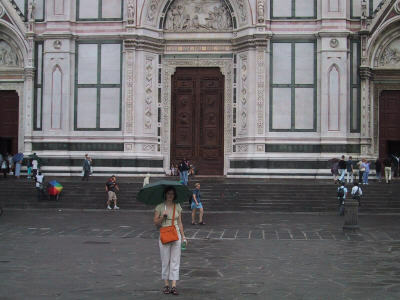 Anyway, we had an absolute blast in Florence, and that trip provided us with the template for our "perfect" holiday. Good food, shopping, great weather, and of course, great friends. Erynn and I will always have a soft spot for the Tuscan experience. 2. He developed his love of the Vespa. 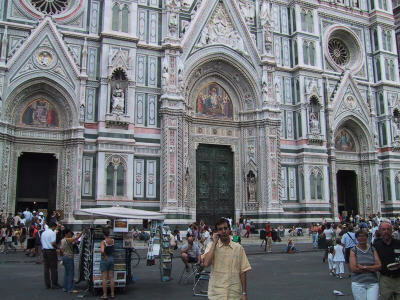 The Duomo is THE major piece of architecture in Florence, and it dominates almost everything around it. The entire facade is covered in fine white, pink and green marble. It is very OTT (over the top). I really don't have a great picture of the whole church because the lens on my digital camera couldn't cope. 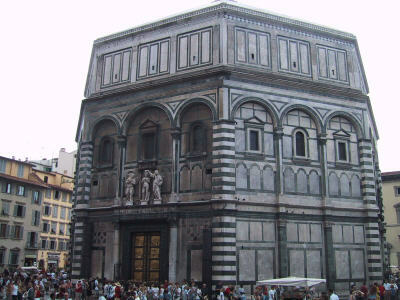 Here is the little baptistry that is located next to the Duomo, which is done in the same pattern and style. 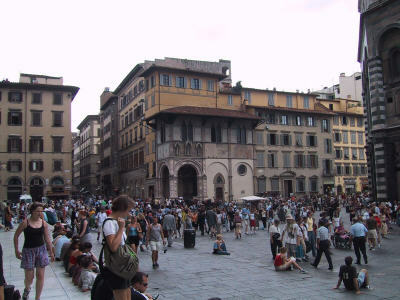 As you may imagine, July is the tourist high season in Italy. Just take a look at the throngs of people loitering around. I think I even took this picture relatively early in the morning too. 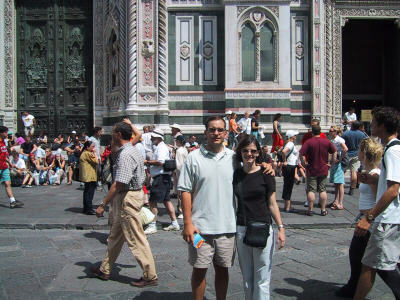 And here are pictures of the happy couples in front of the Duomo. 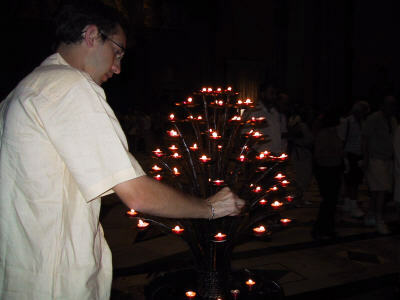 This picture is for Joe's parents to prove that he is a good catholic after all. 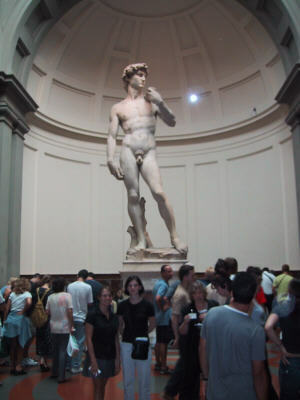 The next "must see" on the trip was Micahelangelo's statue of David. You can just see Erynn and Melissa standing in front of the statue in order to get a sense of proportion. The statue really is that amazing, and definitely worth waiting in the queue. 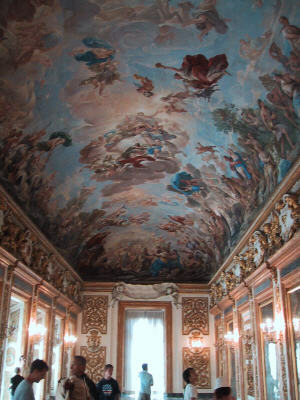 The Medici family were the Bill Gates' of their era. Apparently, they owned everything and built some fabulous buildings including St. Peter's Basilica at The Vatican. 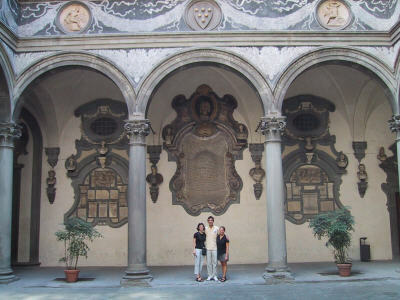 Here are Joe, Melissa, and Erynn inside the Palazzo (Palace) Medici and the ceiling of the Medici Ballroom inside the palace. 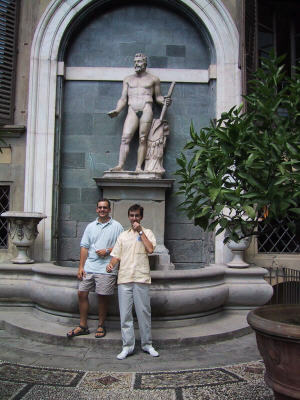 Joe and I decided to be complete morons for a bit inside the Palazzo Medici. The non-digital photos are much better proof of our antics. 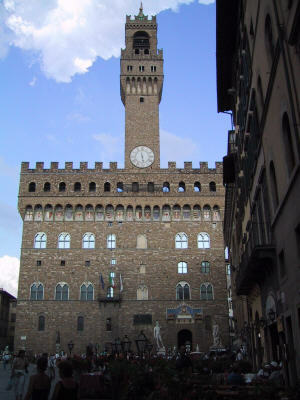 Down the road toward the river is the Palazzo Vecchio. 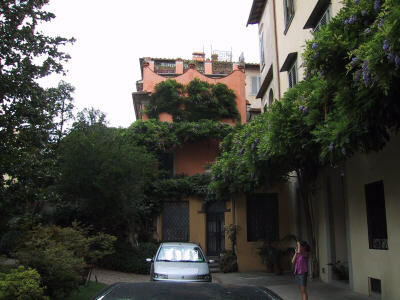 It is another stunning palace with a grand square (piazza) out front. 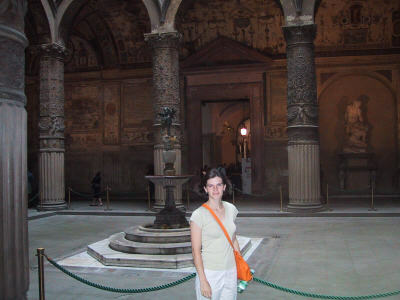 Then there is a picture inside the palace with her beautiful orange purse (more on that later). 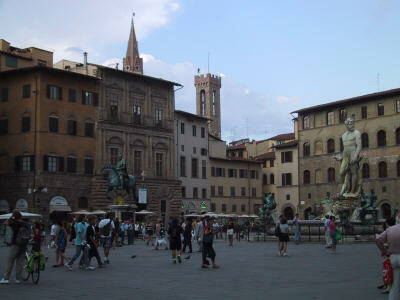 Here is the square just outside of the Palazzo Vecchio. The palace is just out of frame to the right. 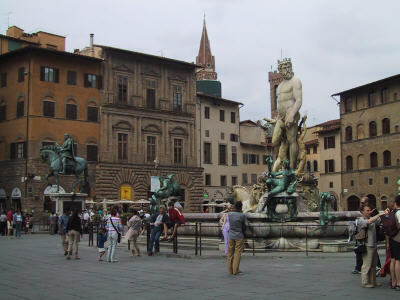 And continuing our walk from the Duomo toward the river and past the Palazzo Vecchio you walk through the Piazza Uffizi. 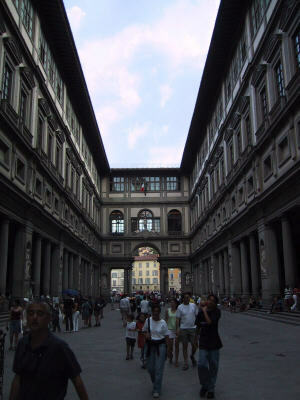 The building around the piazza holds many fine works of art and street beggars. In Italy you can't have one without the other. 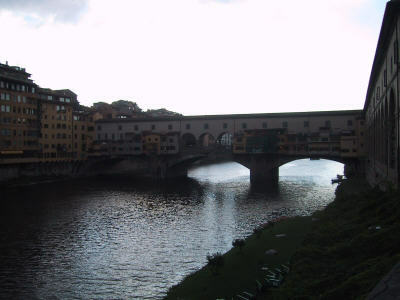 Once you reach the river from the Piazza Ufizi you're struck by the image of the Ponte Vecchio. If you want gold and want to spend too much for it, then this is the place you want to be. 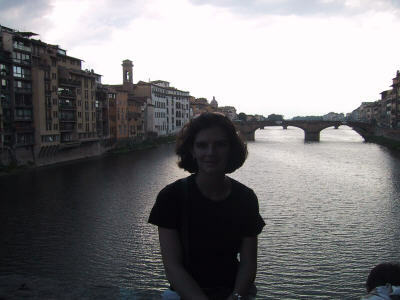 Each shop on the Ponte Vecchio pretty much only sells jewelry to tourists. 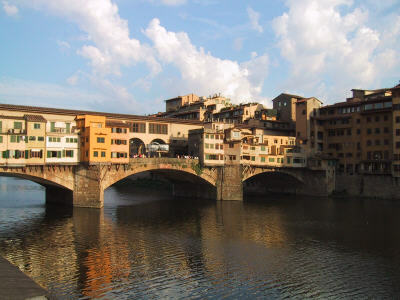 It's a beautiful bridge that spans the River Arno, but is just absolutely packed with tourists. 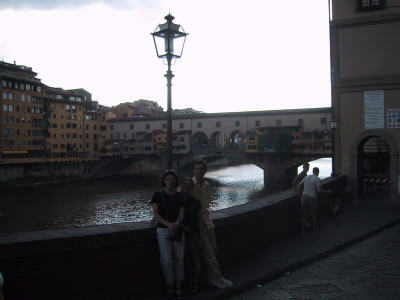 This is also a nice photo of Joe, Erynn and Melisaa with the Ponte Vecchio framed in the background. 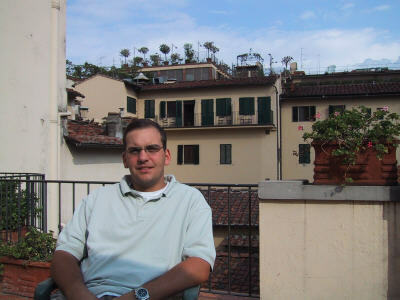 Just to prove that I was on this holiday too, here I am on Joe's hotel balcony waiting for him to finish doing his hair. 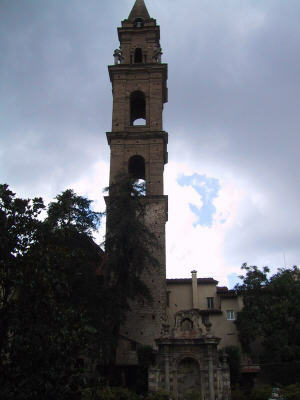 Here's the church of Santa Croce. 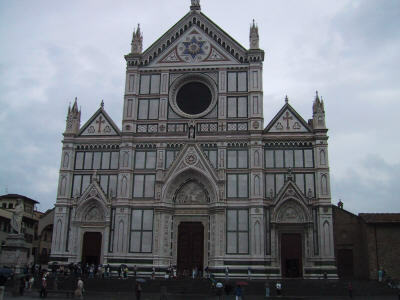 It's of a similar style to the Duomo, but about one-third the size. And there's that orange purse again. I don't have many pictures of what happened to us next, but there are two things you buy in Florence: leather & jewelry. The girls were in one of the famous Florentine leather coat stores when Joe mentioned the desire to purchase some jewelry for his mom. Stopping in this shop was the best call of the trip. Even though we didn't buy any leather jackets, they pointed us to a great jeweler and a restaurant. The jeweler picked us up from the coat store on an electric cart and drove us through town and across the river to his studio where Joe and Melissa bought some stunning jewelry for their family. Later that night we ate at a great place called Quatro Leone. Above are pictures of this guy's courtyard to the studio. Later while Joe and I were checking out the Zenga store, the girls came back with purses (the famous orange one in all the photos). 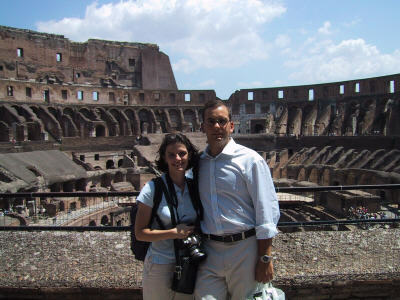 Joe and Melissa left us to continue on with their honeymoon, which gave us a few hours to hang out in Rome before our flight back home. We were basically able to see The Vatican (a.k.a. 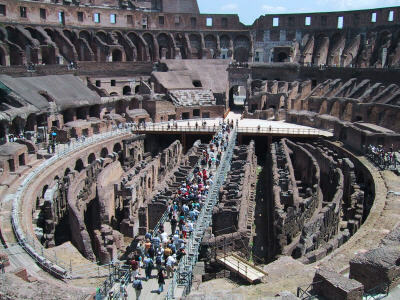 Vegas for Catholics) and the Coloseum. I call The Vatican the Vegas for Catholics because it must have had the same effect hundreds of years ago. I'm sure if they had neon back then they would have covered St. Peter's Basilica in the flashing pink variety. Since they didn't have neon, they used as much lush pink, green and white marble as possible and as much gold leaf to make the place shine. It is absolutely crazy and shocking to think of how much power the Church wielded. 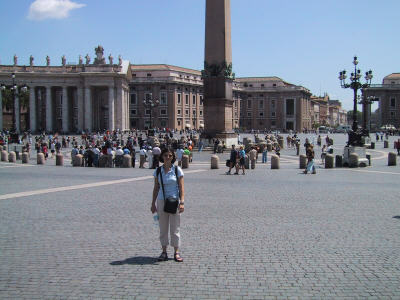 Above is St. Peter's Square and this is where all the people stand to watch the Pope when he does what he does. 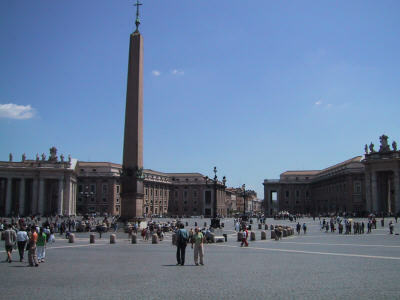 Hundreds of thousands of people cram into this square whenever the Pope addresses the public.